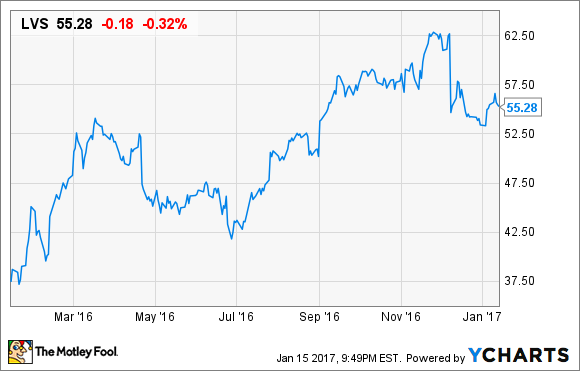 Is Las Vegas Sands Stock a Buy? Could a gaming stock with a high dividend and low debt be just what investors are looking for? The past year has been a big year for Las Vegas Sands Corp. (NYSE:LVS) stock as the company recovered most of what it lost in 2015. And for investors counting on the stock's dividend, the payout has continued uninterrupted. As 2017 begins, should investors be expecting big things from Las Vegas Sands again? Or is the stock priced so high that a price drop is on the horizon? Las Vegas Sands has come a long way from its days as a highly leveraged gaming company. Over the past year it has generated $4.1 billion in EBITDA, a proxy for cash flow from its resorts, and has just $8.0 billion in net debt. That's a fairly low debt ratio, and with few large capital expenditures on the horizon the net debt figure could decline if management doesn't choose to increase dividends or buy back shares. However, the overall value of the company is a little higher. Considering the company's $43.9 billion market cap, its enterprise value to EBITDA ratio is 12.8, which is much higher than that of competitors with ratios around 10. The advantage Las Vegas Sands has over competitors is its low debt and 5.2% dividend yield -- and those may be enough to command a premium in the market. Image source: Las Vegas Sands. Most of Las Vegas Sands' business comes from Asia, and that's caused a rough couple of years for the company. China's crackdown on corruption led to less gambling in its main market of Macau, and that spilled over into Singapore. But Macau seems to have bottomed out, showing year over year gaming revenue growth for the final fiver months in 2016. If growth continues, Las Vegas Sands could be a cheap stock indeed. Las Vegas Sands is also well positioned in the Macau market versus competitors. One of the reasons it held up better than Wynn Resorts (NASDAQ:WYNN) as Macau's gaming revenue declined was its focus on the mass market. VIP play dropped much faster than mass market play over the past two years, and that's helped Las Vegas Sands in comparison to Wynn Resorts. Look for that trend to continue as Macau's recovery favors the mass market as well. The challenges Las Vegas Sands may face in 2017 are more macro in nature, and largely out of its control. The biggest risk is Macau's relationship with China. A crackdown on funds flowing out of China and into Macau could be a big risk and could happen at a moment's notice. It's also unsettling to see talk of a trade war with China, which could see collateral damage in the gaming industry. U.S. companies own a majority of the gaming assets in Macau, and if China is upset about U.S. trade tariffs they would be an easy target for the government. Is Las Vegas Sands a buy? Las Vegas Sands isn't a stock for investors who aren't willing to take some risk, because gaming can be volatile. But given its low debt load and strong dividend yield, I think Las Vegas Sands is still a buy. Macau is on the road to recovery, and as the biggest player in the Macau market Las Vegas Sands has a lot of room for upside, which outweighs the risks right now.